2016 Grammy WINNER for Best Surround Sound Album! Congratulations! From the 58th Annual Grammy Awards goes the trophy to the team of James Guthrie and Joel Plante for Best Surround Sound Album for the 2015 reissue of Roger Waters' 'Amused To Death.' James Guthrie, surround mix engineer; James Guthrie & Joel Plante, surround mastering engineers; James Guthrie, surround producer (Roger Waters). An unblinking look at an entertainment-obsessed society, Amused to Death addresses issues that have only grown in complexity and urgency over the past two decades. With Amused to Death, Roger Waters sounded the alarm about a society increasingly — and unthinkingly — in thrall to its television screens. Twenty-three years later, Amused to Death speaks to our present moment in ways that could scarcely have been anticipated two decades ago. In 2015, television is just one option in an endless array of distractions available to us anytime, anywhere, courtesy of our laptops, tablets and smartphones. With eyes glued to our screens, the dilemmas and injustices of the real world can easily recede from view. 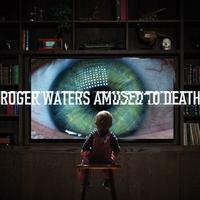 The 2015 SACD edition of Amused to Death features a new 5.1 surround remix of the album completed by longtime Roger Waters / Pink Floyd collaborator and co-producer, James Guthrie. The art has been updated for 2015 by Sean Evans, the creative director of Waters' 2010-2013 "The Wall Live" tour and movie. Bored to death would have been a more descriptive title for this Blu- Ray. I have attempted on several occasions to listen to it but have not been able to tolerate more than a few minutes. On one occasion I tried jumping tracks randomly, hoping to find something worth hearing. I found nothing worth listening to. It's the same funeral dirge from start to finish. I paid $35 for this? A Must Have Killer Remaster !!!!!!!!!!!!!!!!! My congratulations to Roger, Guthrie and Gus and the crew who worked on this absolutely killer remaster. This completely blows away the original version. Even when you listen to the 2 channel comparison to the original CD, it expands the 3D experience to perfection. The original sounds dead and flat in comparison. You will hear things you never heard before with way more detail and clarity. A MUST HAVE !!!!!!!! I hope they do everything else in the catalog this way !!!!! Thanks to Chad and the team. James Guthrie did it again. This is a masterpiece of audio mixing. Without a doubt a step above the DSOTM and WYWH SACD's. I've never heard anything like this in surround music.It maybe even edges out Alan Parsons' quad mix of DSOTM. This will be my go to SACD for a demo of my surround system. It's so amazing how he places different characters in the surround field. It literally sounds like Roger is in the room with you just a few feet in front of you singing just for you. Not just 360 degrees but more like spherical. The QRP vinyl is great too but just can't quite match what the 5.1 SACD mix can do, understandably, but very close. The Qsound on the vinyl is mind boggling also. It's not just stereo. I can't wait to hear his Wall 5.1 mix.